With Easter less than a week away, I wanted to share tips from Ricky Eisen, a renowned Manhattan caterer, on how to create a festive, and easy, Easter party. 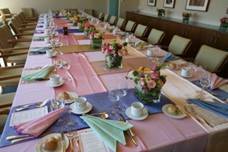 As the owner of Events and Celebrations by Between the Bread, Ms. Eisen’s party planning expertise has resulted in the following fun and unique menu, décor and Easter basket ideas. · Use pastels and flowers to brighten any Easter table setting. 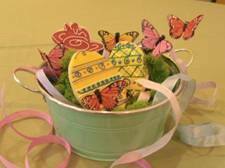 Ricky created a basket-weave tabletop using different brightly colored fabrics and it looks just like an Easter basket! · Create an arrangement of different colored tulips that will make any table more welcoming. Substitute tulips for any other variety of brightly colored flowers. · Ricky used a gardening tin rather than a standard basket and filled it with moss for a more natural, organic feel. She placed store bought butterflies in the moss for extra decoration and filled it with homemade cookies.